I have a collection of scans of the Daily Times from the 1960s and 1970s. They really should be online for everyone to see as they give a wonderful glimpse into Nigeria back in the day. Click the image above and enjoy some history brought to life. If time travel were possible, paying good money to have ones atoms transported and reassembled to the Shrine in the 1970s would be worth every kobo..
what caught my attention here was that majority of the ads were located on the mainland and the raw and gritty part of it as well. It illustrates the fact that my parents generation enjoyed the best nightlife nigeria had to offer and with exciting options and variety and, also in relative safety and peace of mind. This of course is in sharp contrast to what we have today which is the gathering of the pretentious set trying too hard to live the champagne lifestyle and forgetting that real 'fun' is not by frequenting bars/clubs exclusively on the island that sell drinks at astronomical prices and a group of 'nobodies' who believe they are 'somebodies' loitering around like overgrown babies believing in their overblown hype. I wish i existed 'back in the days' when things and people were less pretentious. Time for us to revamp the nightlife and create hidden hotspots, even were it is located in the 'koro' of ajegunle. Yes, please, if you can, you should put as much of these pages as you can online! They would be greatly appreciated. Takes one back... way back. If you have more, please share. It truly feels like looking at a slice of Nigerian life back then. That's because the Island (what little of it there was) was virtually all RESIDENTIAL at that time. Ikoyi was the Lagos version of the old GRA strewn across all of the old regional capitals of Nigeria, while many parts of VI had just been largely reclaimed (and/or was actually still in the process of being reclaimed) and was effectively the New GRA. On the other hand, many of the areas on the Mainland that some might now refer to as "raw and gritty" were actually among the middle class enclaves of Lagos -- Surulere, Yaba, etc. And of course, areas like VI Annex was still the Maroko squatters' slum, Banana Island and Osborne Foreshore had not been reclaimed while the Lekki-Ajah axis was unabashedly rural. 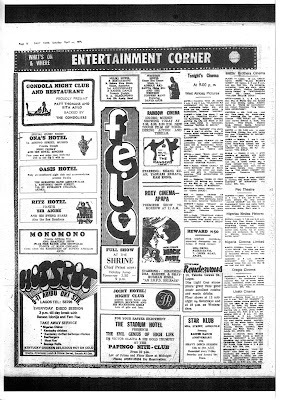 Did you notice how many cinema houses were advertised on this page? Night life in Lagos was a joy back then, not the nightmare it has become now.